European corn borer (ECB) is a common pest of corn in Ohio that may cause economic losses during the growing season. European corn borer infestations differ over time and among geographic regions in the state. Where ECB is active, the development of borers in corn stalks interferes with the flow of nutrients in the host plant, enhances infection by stalk diseases, causes stalk breakage and ear drop, and reduces corn yield. Figure 1. Corn borer egg mass. Figure 2. Larval leaf feeding injury. ECB overwinters as late instar or stage larvae in corn stalks. In the early spring, the overwintering larvae pupate and then emerge as moths that prefer to deposit their egg masses on the underside of leaves of mid-whorl stage corn. Each egg mass appears like a small mass of fish scales and may include 15 to 20 eggs (fig. 1). The eggs hatch into early-instars that initially feed on foliage, causing window-pane injury, and on the tender central whorl, which subsequently leads to shot-hole injury in the emerging foliage (fig. 2). As the larvae become third- and fourth-instars (about 1/2-inch long), they tunnel into the mid-ribs and stalks. There they complete their larval development as fifth-instars and transform into pupae from which adult moths will emerge in midsummer. This larval generation, which occurs in the spring on whorl-stage corn, is called the first brood. During the period of larval development, significant proportions of larvae perish due to natural elements such as heavy rains or predation by beneficial insect predators. Although 15 to 20 larvae may emerge from a single egg mass, it is rare to find one or more mature larvae in a corn stalk or adjacent stalks to which larvae may have migrated. Larvae of the first brood pupate in the stalks and emerge again as adult moths in late July and early August. These adults prefer to deposit their eggs on late-planted corn. The larvae hatching from this generation are referred to as the second brood; they will overwinter as late-instar larvae in corn stubble. Larvae will feed on the surface of the leaves before tunneling into the corn stalk where the predominant feeding occurs (fig. 3). Injury caused by the second brood includes stalk breakage, ear drop due to infestation of shanks, and infestations of the ear (fig. 4). Larvae of the second brood are also susceptible to adverse weather, predators, and parasites. The overwintering larvae are very susceptible to insect, avian, and mammalian predators that become active during the late fall, winter, or early spring. Figure 3. Larva entrance hole with frass. Figure 4. Corn cob tip feeding. 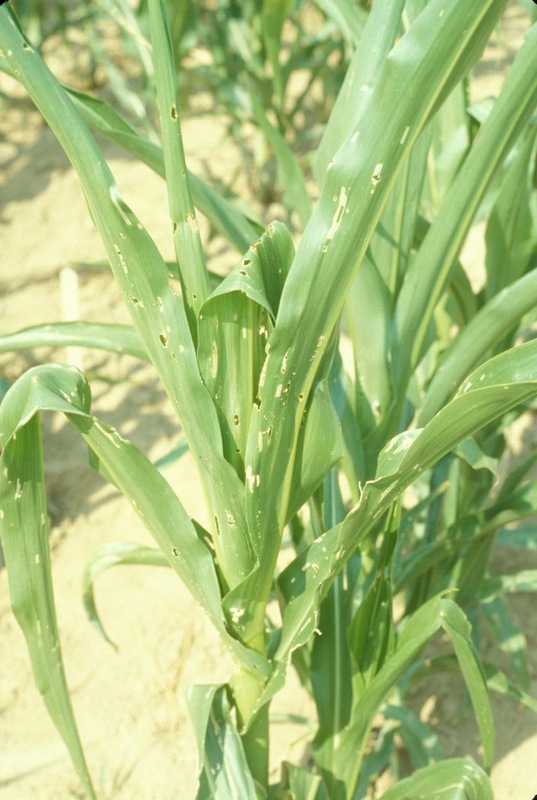 Yield losses due to corn borer can be attributed to a combination of stalk injury by first- or second-brood larvae, ear drop due to second-brood injury to shanks and ears, and enhancement of stalk rot due to microbial infection of injured stalks. In general, if one larva tunnels and completes its development per stalk, the assumption is that a 5% yield reduction may be expected. The severity of ear drop and stalk breakage depends on the incidence and location of borer cavities and environmental conditions favoring plant infections by microbial agents. Sampling for first-brood injury should be initiated when corn is in the whorl stage and early shot-hole foliar injury is evident. Sampling should be based on inspection of a series of 20 plant samples from five or more locations in a field. Notes should be taken on the proportion of the stand exhibiting whorl injury. The whorls of at least two plants from each sample of 20 plants should be dissected to determine the number of larvae per injured plant and the predominant stage of ECB larvae development. Sampling second-brood corn borer is more difficult than first brood, since detection of early larvae on corn in the tassel stage or later is complicated by the size of the corn plant. First brood rescue treatment may be needed when 75% or more of stand is infested and larvae are susceptible to treatment, that is, they have not tunneled into the stalk. Second brood rescue treatment is warranted when egg masses or early larvae are found on 50% or more of plants. Abundant activity of ECB adults along field edges indicates a need for inspection for egg masses or early larvae in corn. However, in a year of heavy second-brood activity, the problem may be forecasted by observation of an abundant summer flight of adults. Assessment of second-brood injury in early September with an emphasis on evaluation of stalk quality and ear shank infestation (fig. 5) will provide relevant information on the need for scheduling timely harvest of corn stands that may be susceptible to significant ear drop or stalk breakage if harvest is delayed. Management of ECB has changed significantly over the past few years, shifting to the use of Bt-corn hybrids, which provide virtually 100% protection against ECB infestation. These products are used as preventive measures against ECB. Transgenic corn hybrids are available containing a Bt corn borer gene alone or more commonly in combination with a Bt gene for control of corn rootworm larval root feeding. Currently, there are three transgenic families from different companies with the Bt-corn borer gene: Agrisure, Herculex, and YieldGard. Hybrids from these families with the Bt-corn borer gene provide excellent control of ECB. When using any of these transgenic corn hybrids whether with the transgenic CB trait alone or in combination, growers need to follow certain EPA regulations that include the use of a 20% refuge. Growers should see their seed dealers for all the requirements and guidelines to follow when planting transgenic hybrids. If not using a transgenic hybrid containing a Bt gene for ECB control, growers should scout their fields as described above and use a rescue treatment if necessary. If a rescue treatment is under consideration, a foliar treatment should be applied before larvae begin tunneling into the stalk. Applications of granular foliar treatments tend to be more effective than liquid treatments. Treatments are not effective once larvae have bored deep into plants and become out of reach from chemical treatment. See Ohio State University Extension Bulletin 545, Control of Insect Pests of Field Crops, for those insecticides labeled for European corn borer, or for all insecticides labeled on corn. Bulletin 545 can be accessed at agcrops.osu.edu/publications. This publication refers to pesticide recommendations in Bulletin 545 that are subject to change at any time. These recommendations are provided only as a guide. It is always the pesticide applicator's responsibility, by law, to read and follow all current label directions for the specific pesticide being used. Due to constantly changing labels and product registration, some of the recommendations given in this writing may no longer be legal by the time you read them. If any information in these recommendations disagrees with the label, the recommendation must be disregarded. No endorsement is intended for products mentioned, nor is criticism meant for products not mentioned. The authors, Ohio State University Extension, and the Ohio Agricultural Research and Development Center assume no liability resulting from the use of these recommendations. Additional information is available from your local Extension office or The Ohio State University Entomology Agronomic Crops Insects website (entomology.osu.edu/ag/).